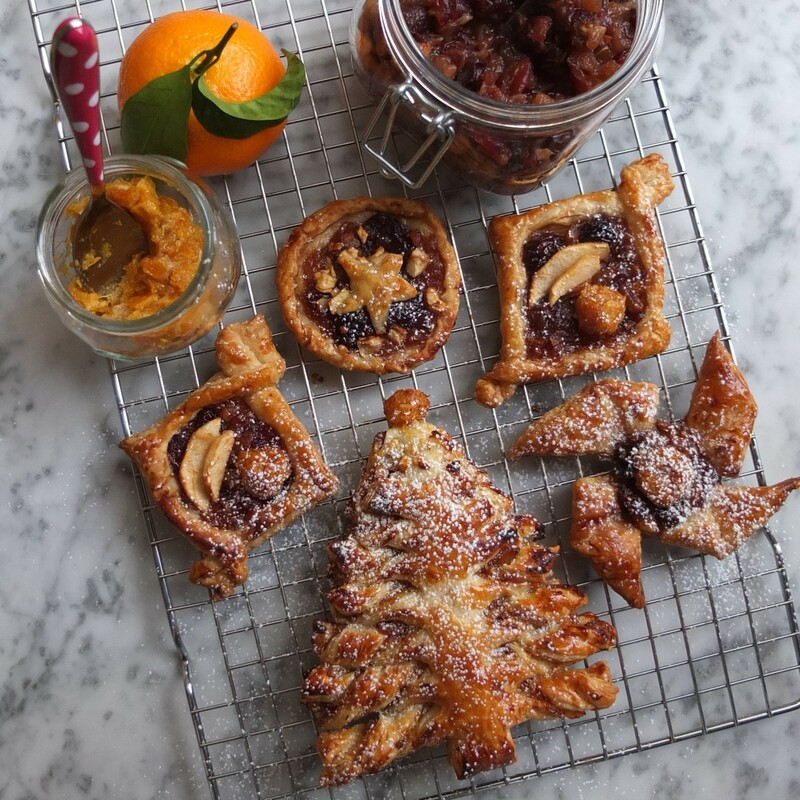 That was the first pastry tree I made and loved so much the next day I rounded up the remaining pastry, mincemeat and mandarin jam to make three more trees and rolled mini pastries. For … um… test purposes! Lol. It took around 15 minutes to fill and shape the trees and 20 minutes to bake. Not bad for a Sunday morning between proving and baking a brioche just before heading out to meet a friend for lunch. I handed her a tupperware container and said ‘I brought you a Christmas tree’! Always a nice thing to say. Later she let me know her tree was really yummy and she could taste the delicious mandarin jam in there too! 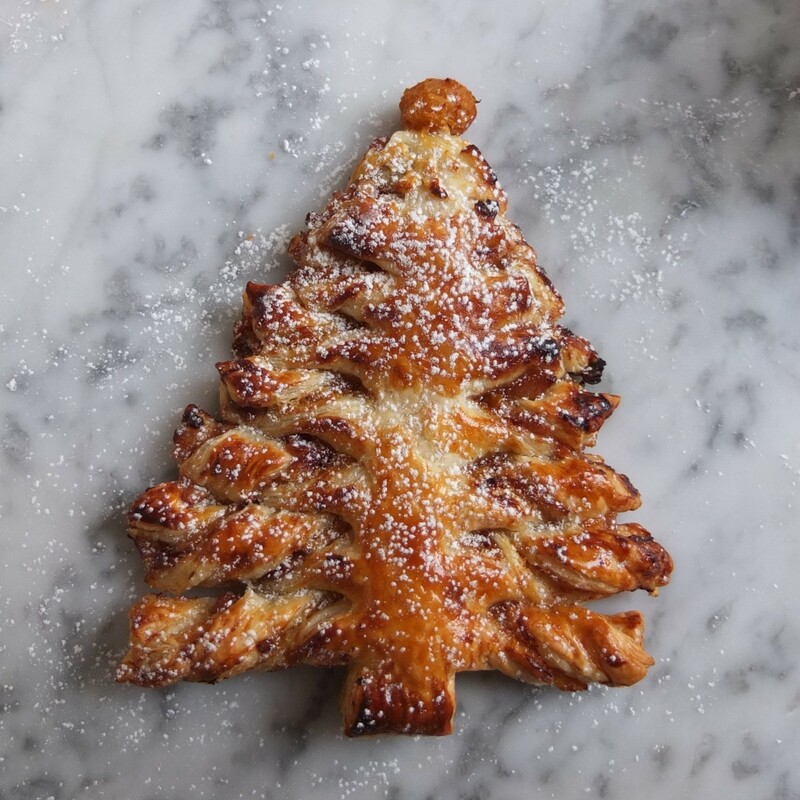 Wouldn’t you like a nice little pastry tree?! You could have a Nutella filling or pesto, goats’ cheese, spinach, pasta sauce…! 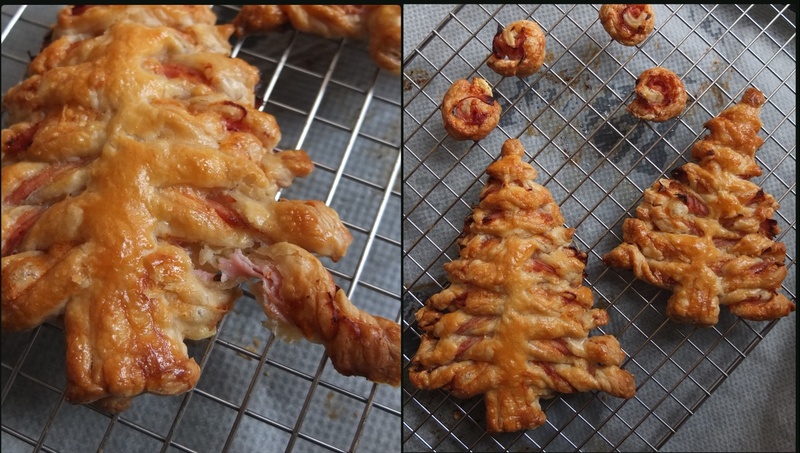 I’ve made ham and cheese trees a few times with shop-bought and homemade spelt puff pastry and they were all amazingly delicious and addictive! They make a great aperitif or snack so instructions for making them are included below. 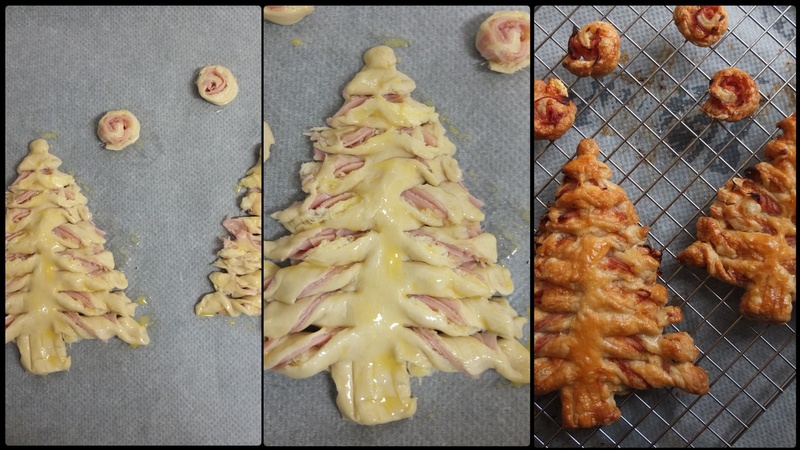 These puff pastry trees are inspired by an Instagram photo I saw and various nutella tree youtube videos. I thought instead of nutella I’d try a mincemeat filling lightened with citrus jam. The jam’s naturally vegan and the small quantity of butter in the mincemeat can be replaced with vegan margarine. Both the jam and mincemeat are glutenfree. You can use vegan or glutenfree puff pastry, available in various supermarkets. 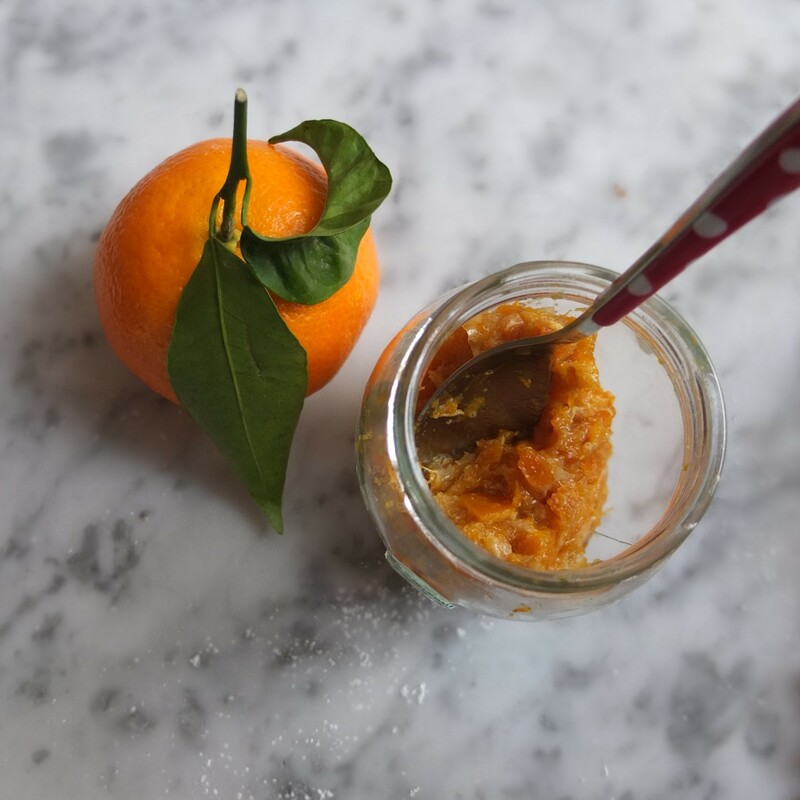 For more details and photos of the process please see the full recipe for Mandarin or clementine compote-like jam in my basics section. Note: Taste after 30 minutes to see if you’d like more maple syrup in the jam (but remember mincemeat’s quite sweet so it’s great if the jam’s a bit tart). Towards the end stir often so it doesn’t burn or stick. 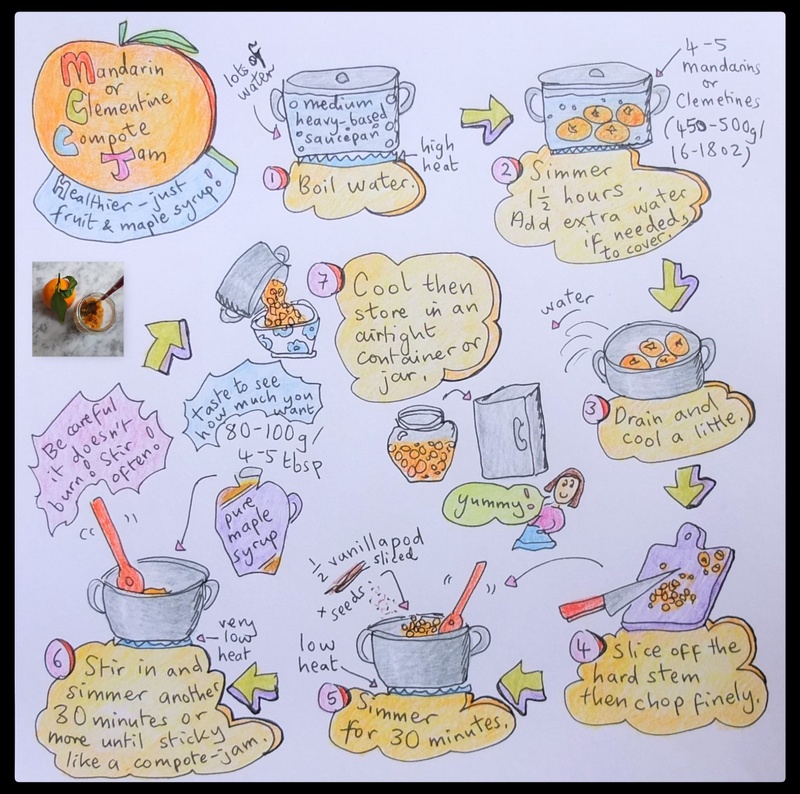 The mandarin or clementine jam can be stored in airtight tupperware in the fridge up to 1 week or wrap tightly in plastic film and freeze up to 2 months. 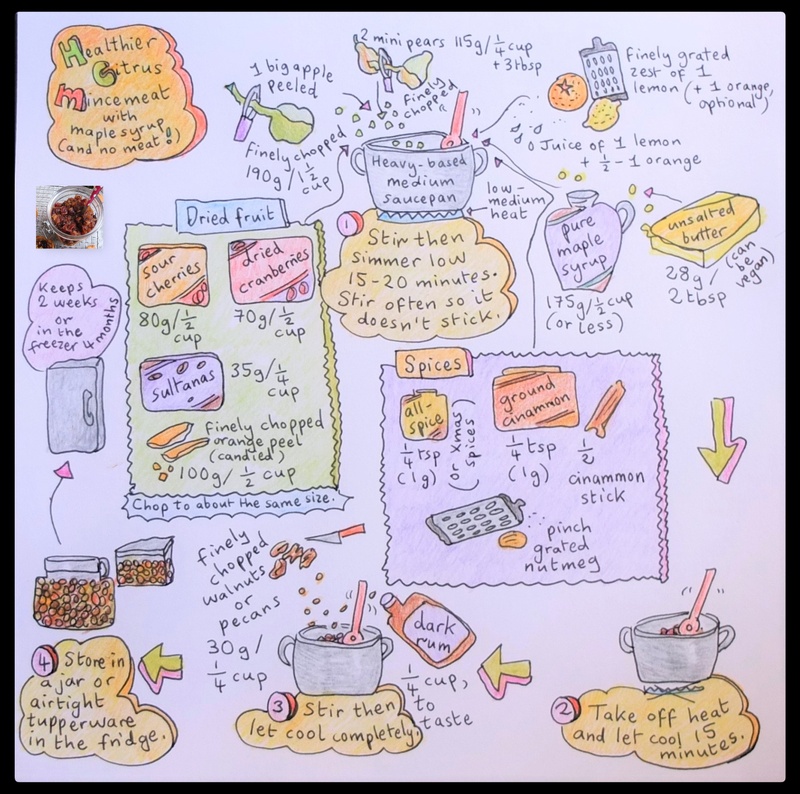 Just to answer the question ‘Why is it called mincemeat when it’s full of dried fruit?’ Well originally in the middle ages it did contain meat chopped very finely and even today many versions contain suet. Luckily for vegetarians and vegans (or people who don’t want meat in their fruit pies!) there are lots of commercial meatless mincemeats available. Note: after weighing chop the sour cherries, cranberries and sultanas a little so they’re a similar size to the other dried fruit. If you’d like more details and photos for the process please go to my citrus mincemeat recipe in the basics section. It can be stored in airtight tupperware in the fridge up to 2 weeks or wrap tightly in plastic film and freeze up to 4 months. 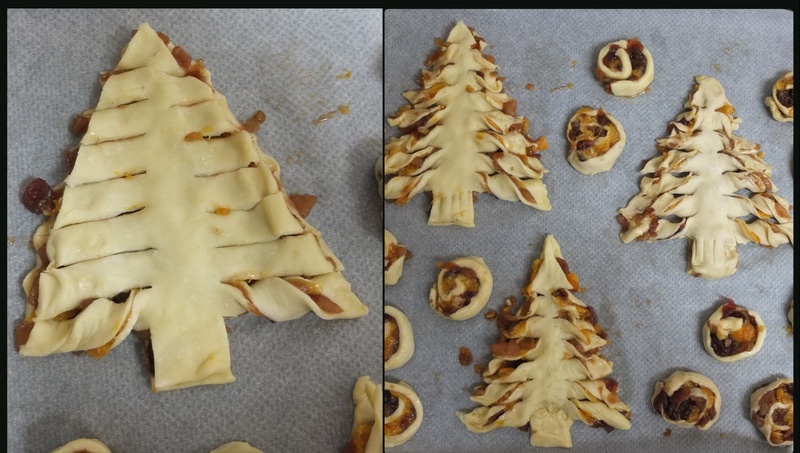 To make around 4 trees and some little roll pastries. The trees are small-medium sized and I could easily eat one tree in a sitting (at least). The measurements work well for me but please make any size you like or 1 big tree. 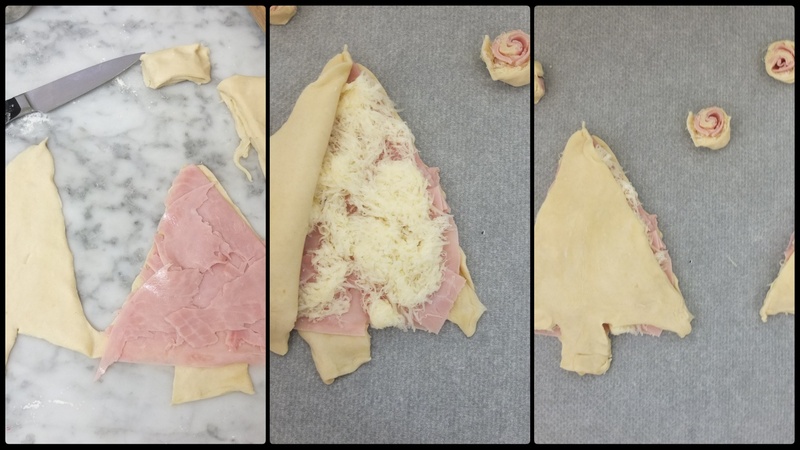 My system using the leftover triangles is great because you don’t roll the pastry out again and there’s no waste! Hurray! 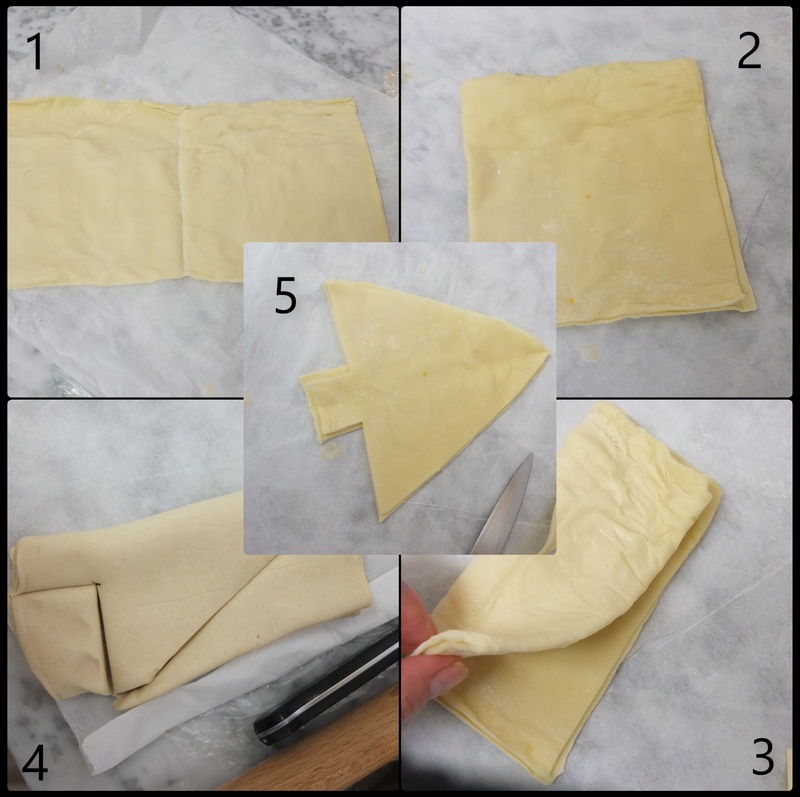 Roll out one square of 100g/3.5oz to make a rectangle about 15cm/6in high and 25cm/10in wide (the pastry should be quite thin – about 2mm/a little more than 1/16in). Tree 1: fold the rectangle over once then again and cut out the two trees, separating them carefully. Tree 2: use the four leftover triangles you cut off on each side to make a second tree and the extra pastry from the bottom to make the trunk (if you push the two separate triangles together for the bottom layer and keep the nicer triangle for the top it looks fine). 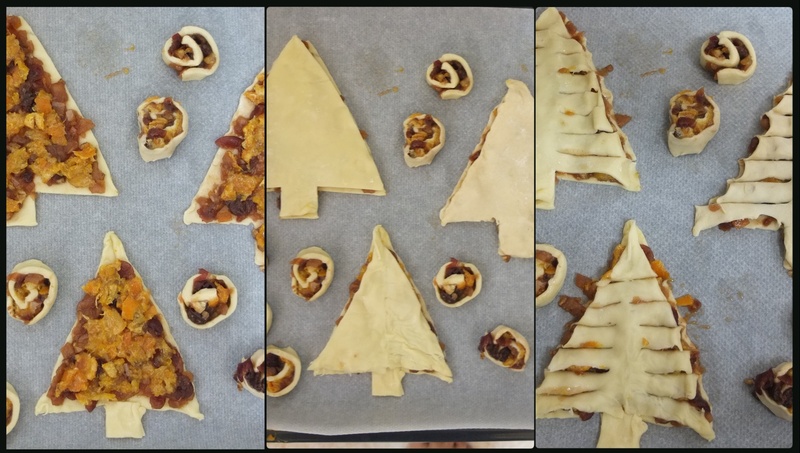 Repeat steps 1 to 3 with the other 100g/3.5oz of pastry to make trees 3 and 4. 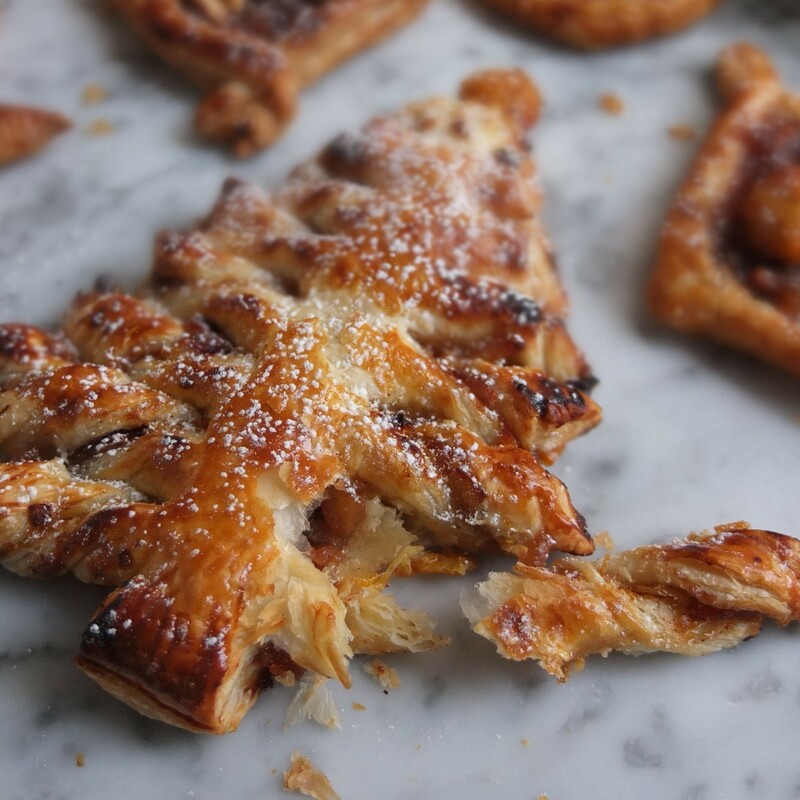 Use the little bits of pastry left over from the bottom to make 1 or 2 rectangles. 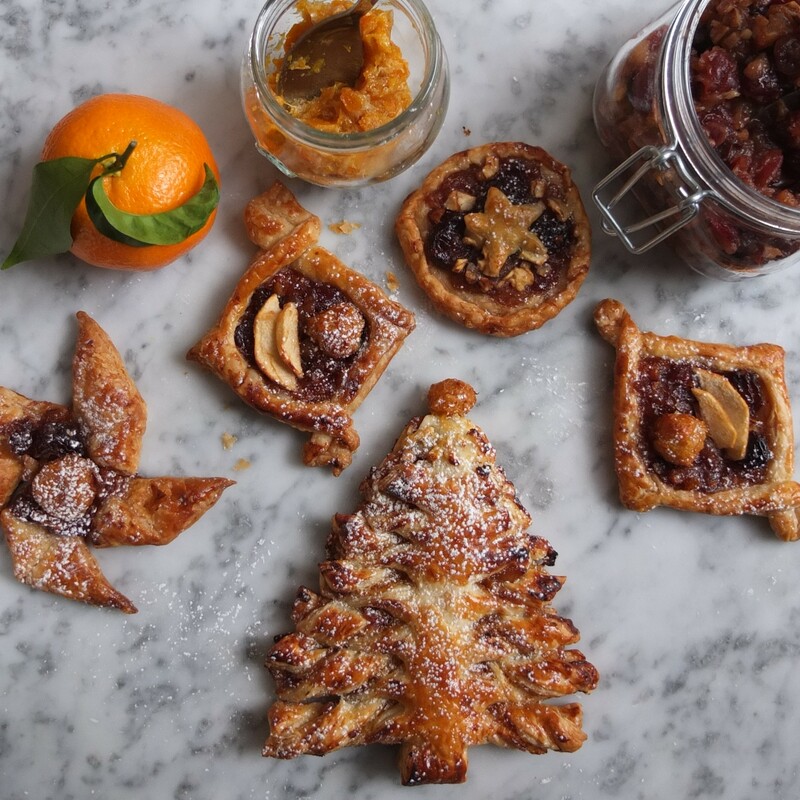 Spread a thin layer of mincemeat over all the pastry trees and rectangles (on the bottom layer), taking out big pieces of dried fruit. 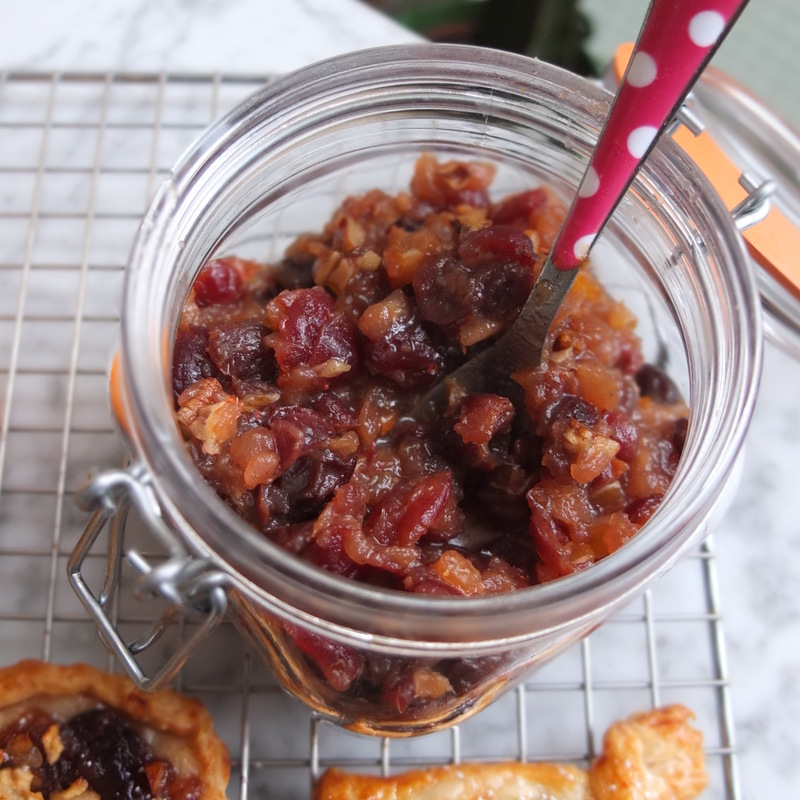 Spread a thin layer of the mandarin jam over the mincemeat – if it’s difficult to spread just press pieces of it into the mincemeat to mix it in and make one combined layer. Place the second layers of pastry trees on top. Roll the rectangles then slice with your knife to make rolls. Place on the baking tray and press down a little. 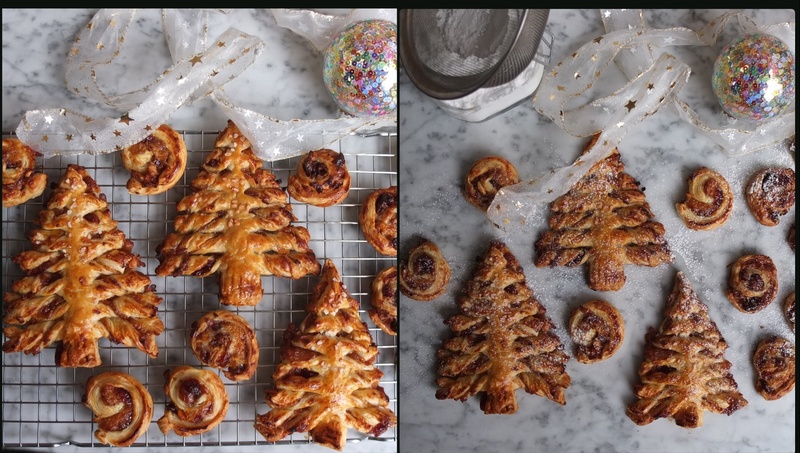 If you haven’t already moved the trees to your lined baking sheet then do this now, moving them carefully. With a small sharp knife cut ‘branches’ into the trees, leaving a trunk in the middle. Starting with the bottom branch lift and twist towards you (pulling outward just a little) then carefully press down the end a little onto the baking tray. As you go higher only twist once on shorter branches. Brush the trees and rolls with beaten egg. Bake 18-25 minutes in the middle of the oven until golden brown. Leave on the baking tray 5 minutes then carefully move to a wire rack to cool. When cooler sprinkle with icing sugar (for sweet fillings). To make other kinds of pastries like pinwheels and diamonds have a look at the instructions on my fruit puff pastries post. All the trees are delicious warm or eaten at room temperature the same day. Store till the next day in airtight glass jars or tupperware in the fridge and they’ll be softer but the flavours will be even more developped, yum! They’ve never made it to day 3 but I imagine they’d be fine then too. Or freeze tightly wrapped in plastic film then reheat briefly in the oven to refresh. It’s that time of the year. Hurray! Even if you don’t celebrate it’s a merry old time. And is it just me that finds Christmas shopping dangerous? I ended up with a lovely shirt and fluffy onesie bear pyjama for myself today… oops! I’m really happy to have found this easy but tasty tree invention online – I think it was on Instagram I first saw a nutella tree then on youtube I watched the videos. So I hope the idea comes in handy for you too. Could be a great festive treat! 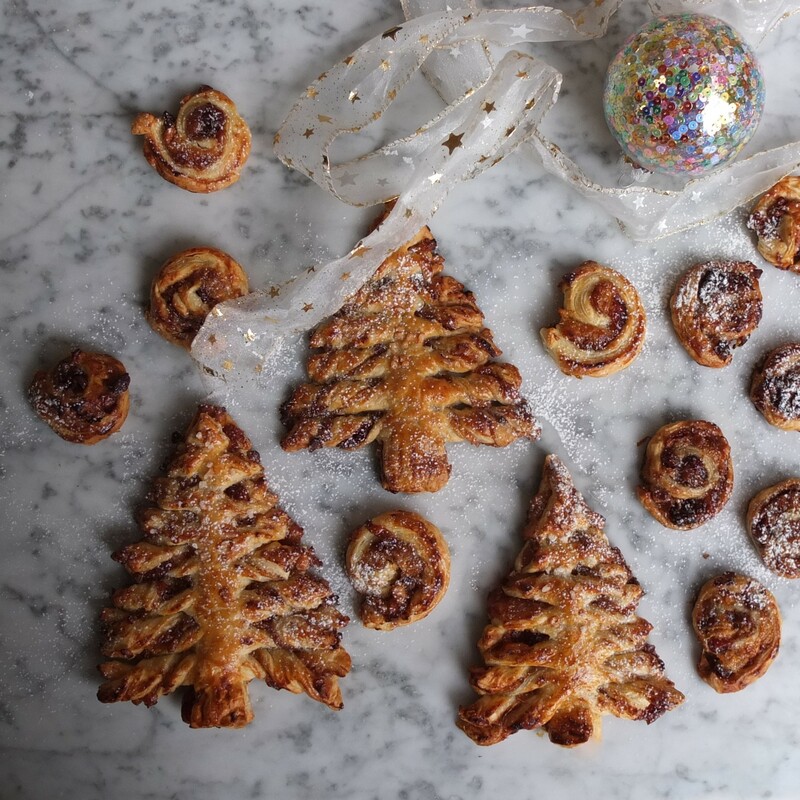 Want to try an absolutely delicious mincemeat and mandarin puff pastry Christmas tree? The tree is so cute and perfect! Loved the Ham and cheese trees! !Definitely a must on a Christmas brunch!